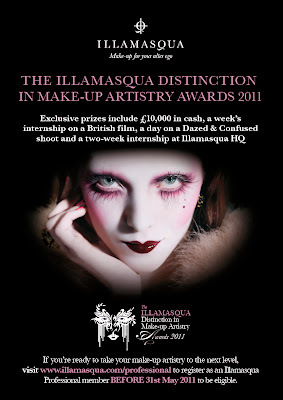 Introducing Illamasqua’s Distinction in Make-up Artistry Awards! Read on to find out more about this fantastic opportunity for the budding make-up artists among you! Win a week’s internship with Christine Blundell, Academy & BAFTA Award winning make-up artist and hair designer, on her next British film, £5,000 prize money and £500 to spend at a private shopping spree at the Illamasqua Flagship Store. Win a day assisting Illamasqua Creative Director Alex Box on a Dazed & Confused fashion shoot published in early 2012, £2,500 prize money and £500 to spend at a private shopping spree at the Illamasqua Flagship Store. Plus your college will receive £2,000 to spend on a bespoke Illamasqua kit of your tutor’s choice. Win a two-week internship at Illamasqua Head Quarters – the creative hub of the brand – plus £1,500 prize money and £500 to spend at a private shopping spree at the Illamasqua Flagship Store. Plus your college will receive £2,000 to spend on a bespoke Illamasqua kit of your tutor’s choice. In December the winners from each of the four categories will have their winning creations running on Dazed Digital viewed by millions all over the globe. 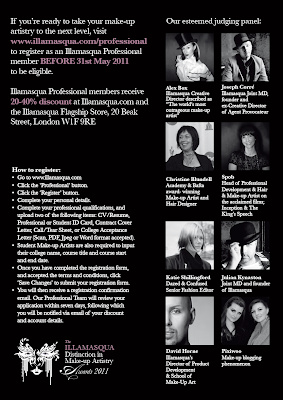 This will take place at Illamasqua’s Flagship store at 20 Beak St, London W1 [15th/16th October 2011] where floor judges will assess the finalists as they create a specific, to be revealed Illamasqua theme, which will be marked on technical skill, professionalism and hygiene. The final looks will then be judged by the curtain judges away from the make-up artist contestants to assess purely on technical and creative skill. This will be run through Illamasqua.com. Winners announced 1st November 2011. The Winner in each category will be based upon highest score accumulated from the judging panel and public vote. 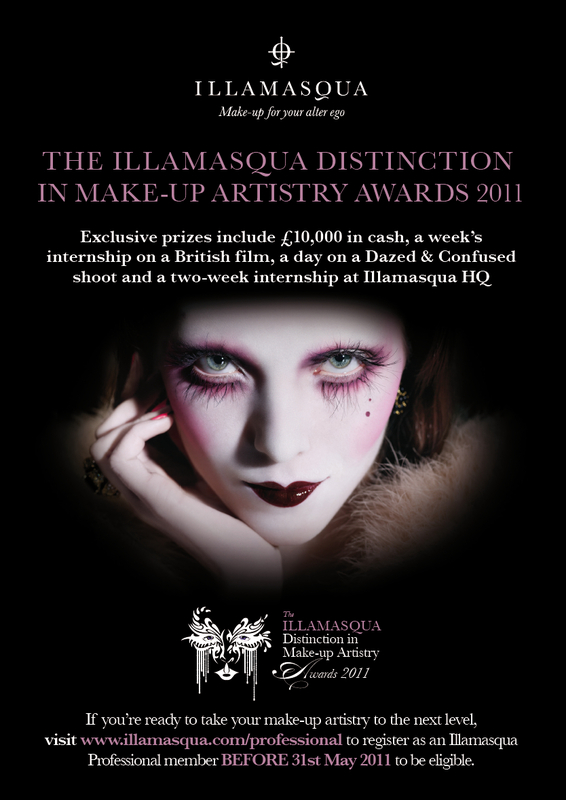 This competition is only open to students and recent graduates who have registered and been accepted as an Illamasqua Professional member at www.illamasqua.com/professional. 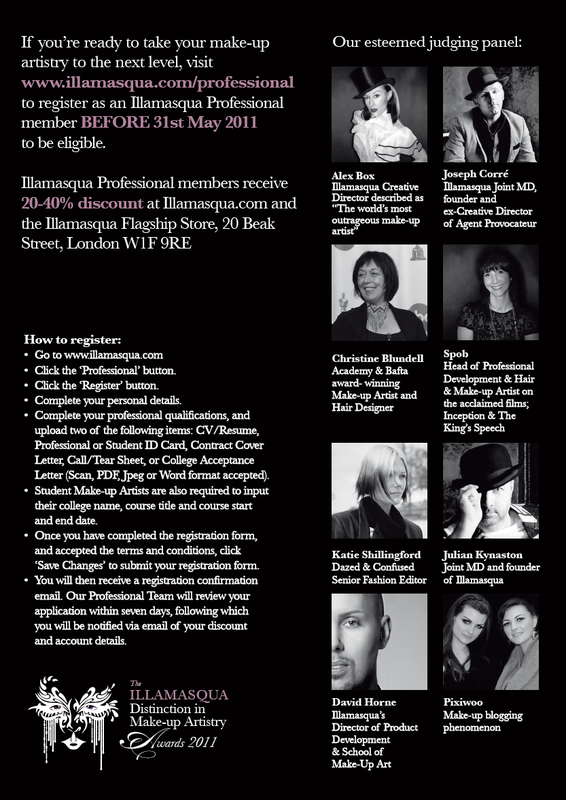 Please note that only professional members who have registered by 31st May 2011 are eligible. All new and existing members will be sent the competition application pack after this date, and will include more detail on this fantastic competition. The application form and brief will be available from 1st April online and will ask you to create two make-up looks, one beauty, and one fantasy, of your choice.